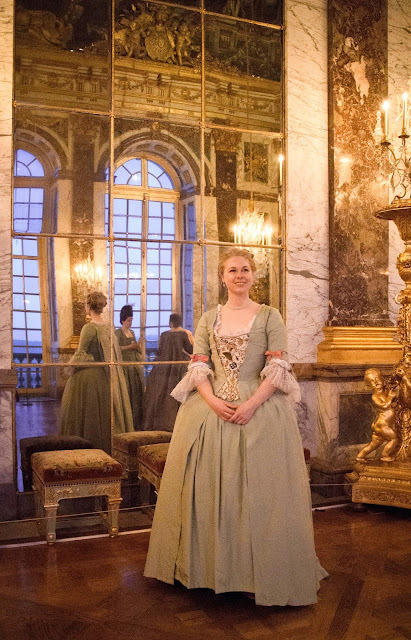 Note: this dress has since been updated, and was worn to the annual ball in the Hall of Mirrors at the Palace of Versailles. I'll post a couple of photos below, and the rest can be viewed on the dedicated entry, here. 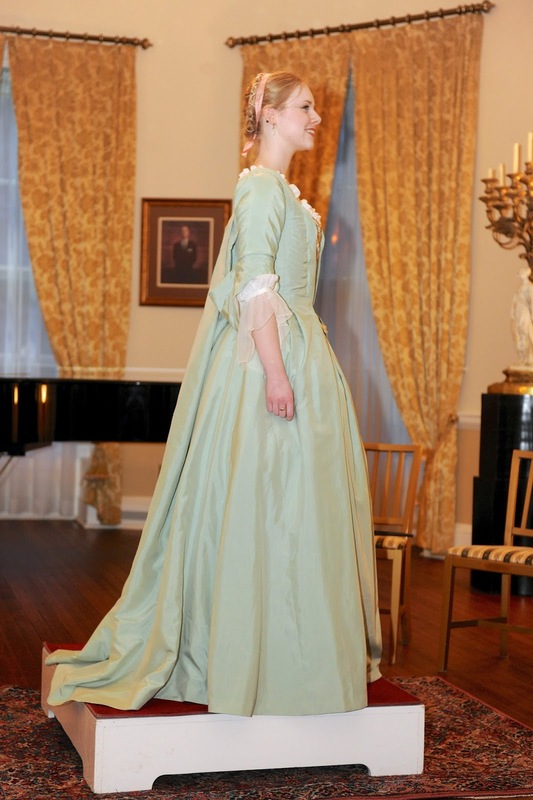 Also in that entry is a longer piece on Dame Marie-Josephe Le Borgne de Belle Isle, who died at Louisbourg, Cape Breton in 1754, and whose life and inventory inspired this gown. No more sad, droopy fold beside the stomacher! New lace ruffles! Better hems! 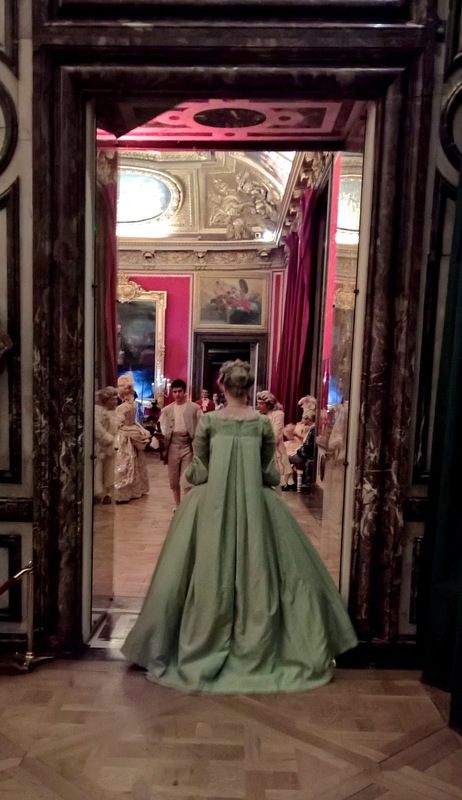 There was a great deal of swooshing in and out of the Hall of Mirrors. The North American contingent met up at the ball (a bunch of New England ladies and me, Token Canadian). This post has been a long time coming. I keep meaning to write it, and then not having the time to do it justice. 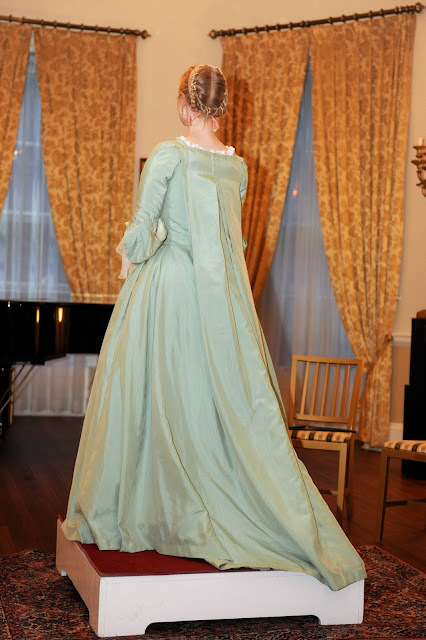 This gown was a learning process for me, and I poured many, many hours of research into it (not to mention the hours and hours of completely hand-stitching and hand-embroidering it…), so I’d like to share as much of my making process as I can. As always, I’ll start with a few photos of the finished product, and then I’ll go into detail on the very belated dress diary. The diary for the undergarments (chemise, hoop, stays) made for this outfit can be found here. This dress is a little different for me in that I was attempting to copy, as closely as possible, a real extant gown currently held in the collections of the L.A. County Museum of Art (LACMA), as well as the embroidered stomacher displayed with it. I had only the photos on the website, with no patterns or views of the gown innards, so I had to do some guesswork based on other extant pieces. To further supplement this, I referred to the books of research and patterns published by Janet Arnold, Norah Waugh, and the Williamsburg Association. I believe I came as close as I could, given my time and resources, to accurately replicating the gown. 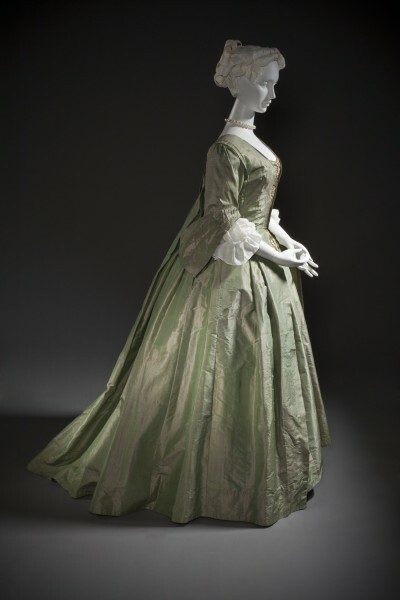 Here is the LACMA’s page for this gown. I started making the undergarments for this ensemble last September. 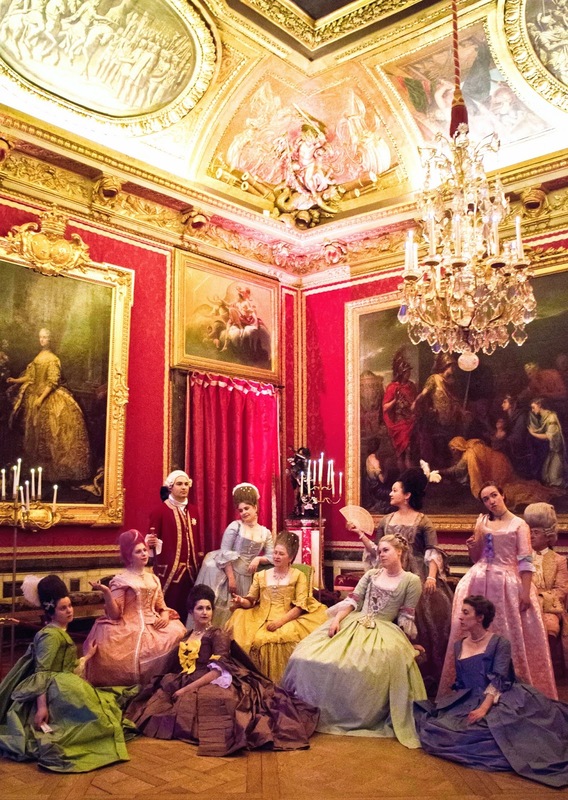 The whole thing was part of a joint project between Dalhousie University’s fourth-year costume studies students (led by our professor, Dr. Lynn Sorge-English, whose specialty is 18th century dress) and Fortress Louisbourg in Cape Breton, which celebrated its 300th anniversary last year. 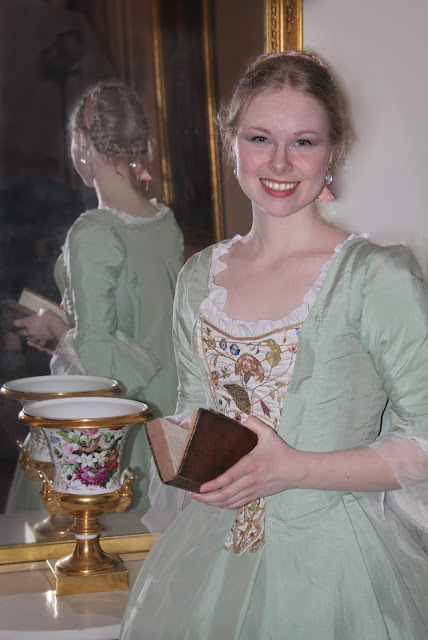 The project aimed to research the women who lived at Louisbourg during the French Occupation (c. 1713-1745), and then create an ensemble of clothing that they might have worn to bring them to life. 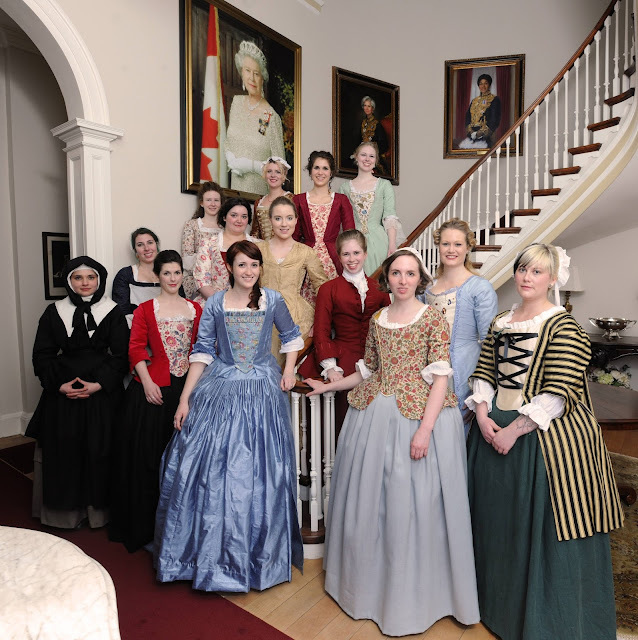 A fashion show of these ensembles was held this past April at Government House in Halifax to showcase the resulting work. The town of Louisbourg was a place of wealth during this period, as a centre of trade for the French New World, so it was quite common to find multiple silk garments in the death inventories we looked at. This French practice, whereby a person’s house was immediately closed off upon his or her death so that the entirety of the deceased’s possessions could be counted and listed in the colony’s administrative archives before the will was executed, proved invaluable to our research. These inventories (which, with the exception of a few lost years, were preserved and sent to Montreal when Louisbourg was taken by the English) provided windows into the lives of women who would likely otherwise have been lost to history, allowing us to discern details about their lives and the culture of the town, including relative wealth, local style, and the level of comfort to which people were accustomed. The woman I researched – Dame Marie-Josèphe le Borgne de Belle Isle, who was the wife of a judge and then an officer, of joint French-Acadian and Métis descent, and a minor noblewoman in her own right – owned several silk gowns, including a Robe à la Française of silk taffeta with a matching petticoat. 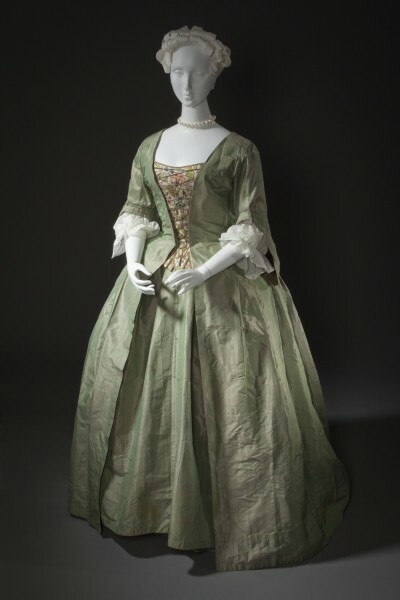 Therefore, this gown from the LACMA, dated to 1745 (formerly dated 1725), seemed ideal. 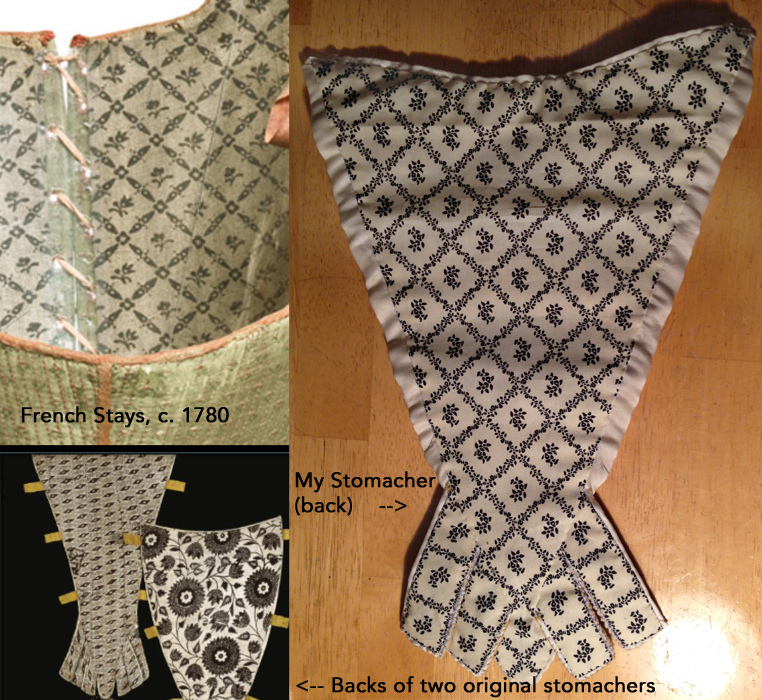 In December, when I was home in Toronto for Christmas, I sourced the fabrics and began working on the stomacher. 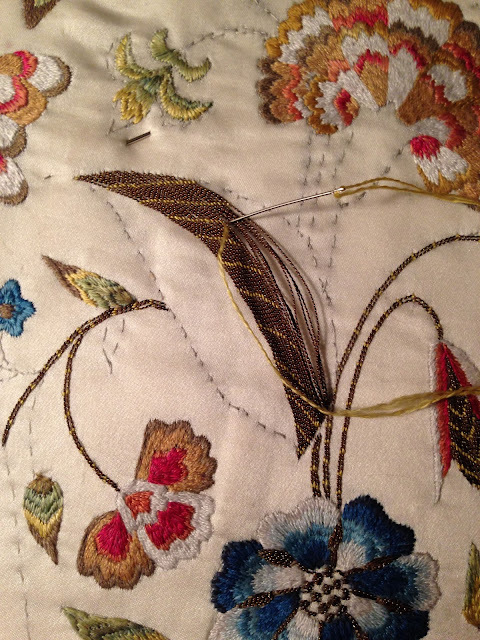 From December to April, I worked steadily on the embroidery. 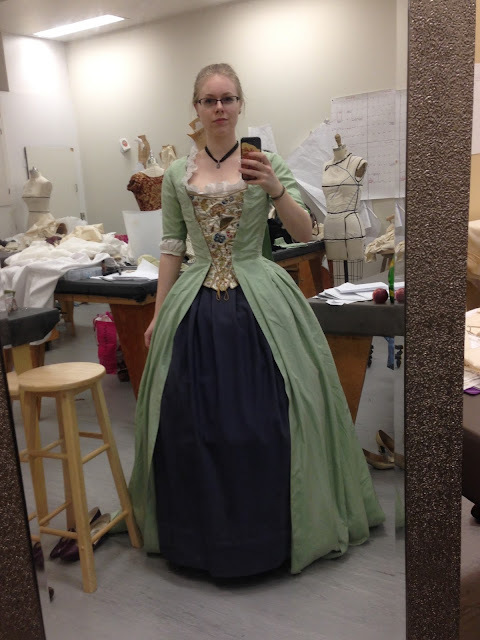 I began seriously working on the gown in early February, after finishing the structural garments and an extra petticoat. Everything was finished by the morning of April 16. These two projects were parallel but largely separate, so I’ll begin with the diary for the gown and then move on to the stomacher. Said spineless silk started life as sky blue $12/m taffeta. I knew it was a little thin, but the price was somewhat of a miracle considering how much I needed. 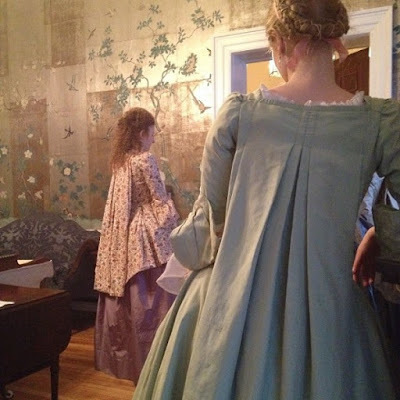 I bought 14 yards for the Robe à la Française and full petticoat – it was 42” wide, and I didn’t want to have to piece in glazed cotton on the back of the petticoat (it's period, but it shouldn't show), in case I wanted to pair it with a short jacket for less fancy wear later (I'm currently in the process of making said jacket, so I'm glad I was able to do it without cotton piecing). Weird lighting here, but top left is original, top right is golden yellow commercial dye for protein fibres, bottom left is the pomegranate, and bottom right is marigold (which is a brighter, yellower green in person). My good friend Greta, a medieval reenactor and textile artist, who has a great deal of experience with natural period dyes, assisted me in dyeing all 14 yards with pomegranate (from Maiwa in Vancouver) to get it to the sage green I needed. We tried several other dyes first, including three different types of commercial protein fibre dyes and two natural dyes, and only the natural dyes took at all. Between marigold and pomegranate, the latter gave the best colour. I soaked the silk overnight in my bathtub (it took up the entire tub) and then we stirred it in the hot dye vat for a full four hours, not stopping our stirring for more than about 3 minutes at any point. I thought my arms would fall off, but it did the trick – the colour was completely and totally even. Not a streak or mottled patch to be found! I’m going to take this opportunity to profess my love for Greta, who is an amazing artist and reenactor, and obviously an awesome and incredibly generous friend. She gave up a lot of time to help me with this project, and I couldn’t have done it without her! She also raised the silk worms, reeled the silk, and dyed the resulting floss with period dyes for my stomacher embroidery – more on that later. If your interest has been piqued, you can find her on tumblr here. This is a pretty early Robe à la Française, and you can see some interesting details that I haven’t seen on later ones. The front of the bodice is shaped with two tucks, which open out into pleats at the waist and extend to match up exactly with the shoulder details on the back. The first tuck meets the back neck edge binding and the outside edge of the top box pleat in a sort of triple-convergence of details, and the second tuck extends over the sleeve head to meet the outside edge of the lower box pleat. This proved somewhat frustrating to drape, but looks really neat when it’s all tacked together. Due to the aforementioned spineless nature of my silk, I had to reinforce the front edges of my gown to keep them smooth over the stomacher. I did this by inserting strips of cotton piqué (the real stuff, which is akin to cardboard woven of cotton), generously given to me from my professor’s personal stash, into the front edges of the silk and extending back past the point where the linen splits into its own layer. 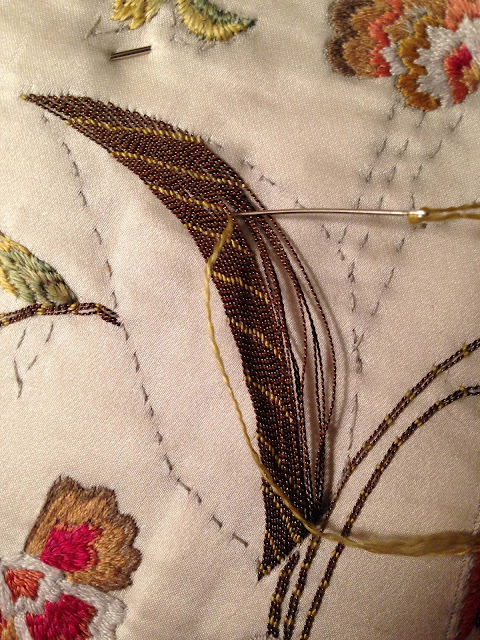 Theoretically, this would allow me to pin the linen layer to the stomacher edges while the silk lay smoothly over top. 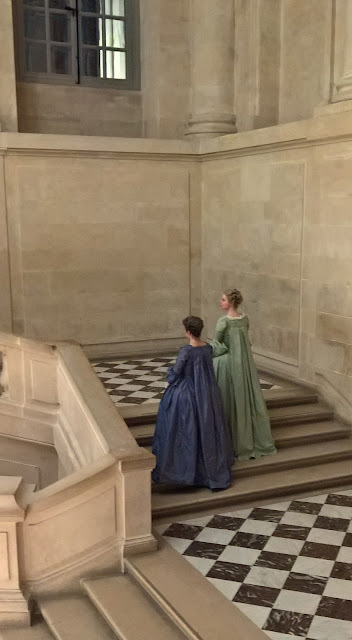 Now, unfortunately (from a costuming standpoint, at least) I lost a bit of weight over the course of the year, and by the time I wore the gown I didn’t have quite enough bust to fill out the torso, so the front edges do gape open a bit at the top of the stomacher. 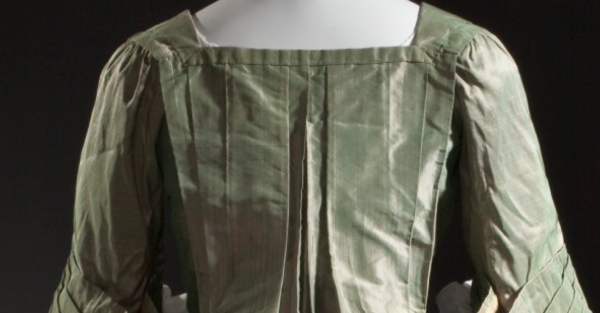 For the same reason, you can see the line where the linen layer splits from the silk layer all the way down the front of the torso (because there’s not enough pressure against them from the inside to keep them taught and flat). I think a lot of this has to do with the fact that the seam that holds the silk closed is also the seam that marks the split between the linen and silk layers. This means that anything pulling the linen side of the Y-shaped split taught will thereby force the silk side to fall open. It still really bothers me, so I think in the next couple of days I will open the front edges of the bodice back up and a) reinforce the silk layer by attaching it to the fronts of the linen underbodice, and b) insert a brand new set of linen flaps further back from the front edge, so that they are sewn only to the linen underbodice layer, and aren’t structurally connected to the silk at all. This have the added benefit of relieving the strain on the silk when the stomacher is being pinned in, and should remove the pulling on the surface. I’ll leave a little opening to the original linen tab right at the waist and the top of the stomacher, so that pins can be inserted to hold the silk down. It will be this sort of thing, with the separate inner tabs. 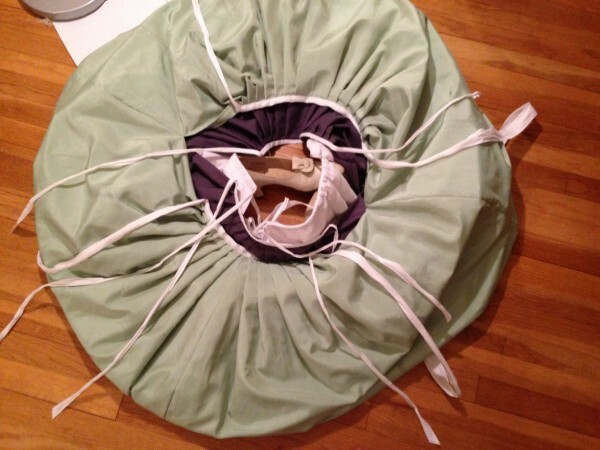 I might even put in a couple of ties so that it can be tied closed underneath the stomacher. I think this sort of under-stomacher closure is just a better option considering the floppiness of my silk. This will make the front similar to the back closure, which utilizes ties as seen in one of the Janet Arnold patterns. 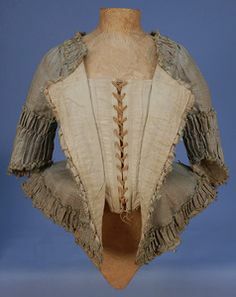 The linen inner bodice of the gown splits open from the shoulder blades down to the waist at centre back, and three sets of ties adjust how tight the gown sits under the pleats. These ties start at the side seam, and are tacked at the side-back seam and at the edges of the split in the linen. I unfortunately didn't take a photo after putting in the tapes, and I don't want to go and completely unwrap the gown now, but three linen ties now pull the sides of that V-split together to tighten the gown against my back. Now on to the stomacher. 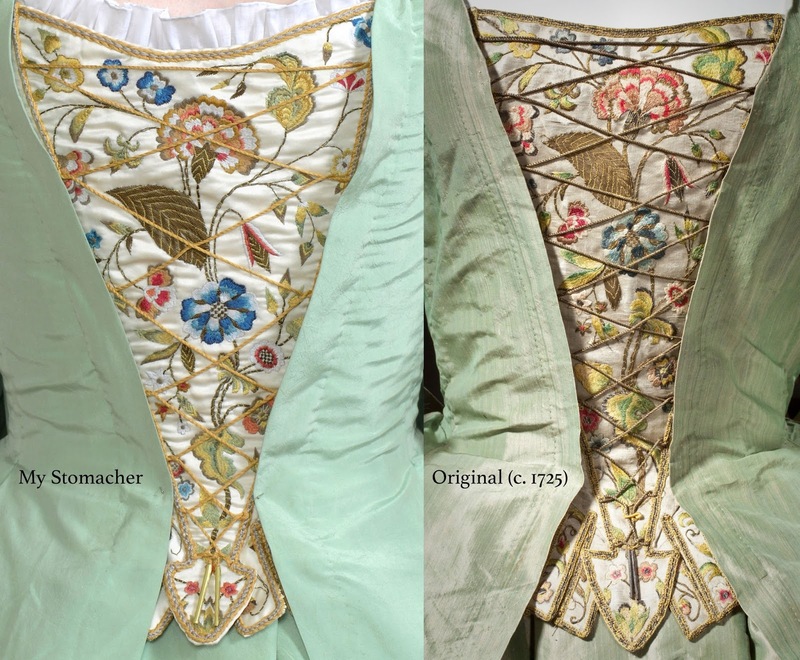 I fell in love with the LACMA gown partially because of the stomacher they had paired it with, so I knew from the beginning that I would be attempting to recreate the stomacher as faithfully and accurately as possible. I sandwiched two layers of linen and a layer of 100% silk satin, and bought an embroidery hoop. I had embroidered a grand total of one satin-stitched letter in the past – a large ‘Q’ for an SCA belt favour – so I was kind of diving in blind. I flipped the image of the stomacher on my computer so that it was mirrored and then copied it freehand onto the linen. In retrospect I should maybe have printed it out and tried to copy it, because mine is slightly off. But live and learn. This photo is mirrored. Woops. I then quilted the entire pattern through to the silk satin, both to attach and stabilize the three layers and so that I wouldn’t have to keep flipping the thing over to see the lines while I embroidered. It took a little while, but I’m glad I did this step. I think it saved a lot of frustration later. Once this was done, I just embroidered. And embroidered. And embroidered. I got a lot better, smoother, and faster as I went. As I mentioned, I was embroidering with silk floss hand-made entirely by my friend Greta Pepper, who raised the silk worms in Halifax, reeled the silk, and dyed everything with natural period dyes. She’s awesome. I also filled in two or three shades with commercial silk floss, courtesy of another reenacting friend, Kelly, and the darkest blue is from Hedgehog Handiworks – it’s also hand-dyed with natural dye. The large leaf and all the stems, as well as the checkered flower centers, are done in Hedgehog Handiworks’ “Gilt Sylke Twist” – filament silk twisted with a tiny wire of real gold – in dark brown/”bronze.” It has a tendency to twist itself into knots, and the wire itself is incredibly fragile, so it was slightly frustrating to work with before I got the hang of it. I couched it down with the thinnest strands of Greta’s marigold yellow silks. I ran a length of metallic thread back and forth first until it ran out, and couched the rows down, and then repeated the process. This seemed to be the fastest way, and the most efficient use of my yellow silk. My professors were gracious enough to allow me to embroider during just about every class throughout winter term – one history professor, with no connection or duty to the costume studies program, even made a point of opening curtains during lectures so that I could see what I was doing! If I hadn’t been able to embroider during lectures, I don’t know that I would have finished on time. Some of you reading this are likely experienced embroiderers, and would have had such a small piece done in no time, but keep in mind that I had never embroidered before, and was teaching myself on the fly. 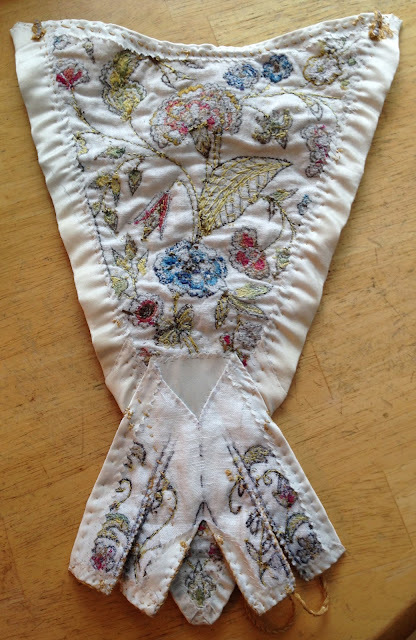 Once the main triangle of the stomacher was complete (around the last week of March), I repeated the process of sketching, quilting, and embroidering the false tabs at the bottom. These are done separately, as in the original, and then attached to the back of the main piece. Before I attached the tab piece to the main piece, I trimmed the linen layers down to the finished dimensions and folded the satin around to the back, leaving as much excess as possible, and then basted it down securely. This gave me a nice clean border of satin around the back, so that the lining could sit in from the edges a bit. 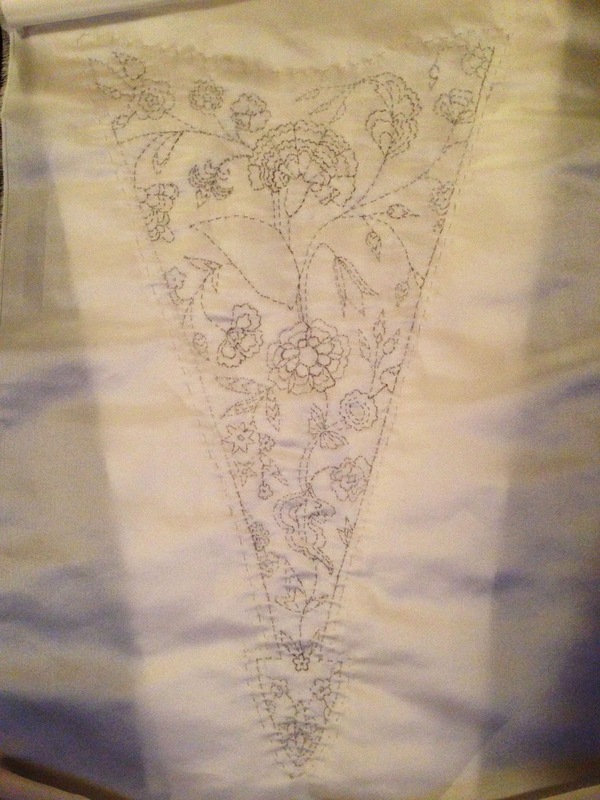 Before I lined the stomacher, I made and attached the braided edging on the front. Using gold silk floss and silver cotton floss, I fingerloop-braided it in the “French Cord” pattern described in the second volume of the V&A’s Seventeenth Century Women's Dress Patterns (both volumes are excellent books - I highly recommend them!). Before I stitched the cord down, I ironed it flat on a pretty high heat in order to a) make it less like cord and more like ribbon, b) stabilize it, since it was a bit like a slinky and got wider or thinner and longer or shorter depending on how it was sitting, and c) even it out to a slightly more consistent width. 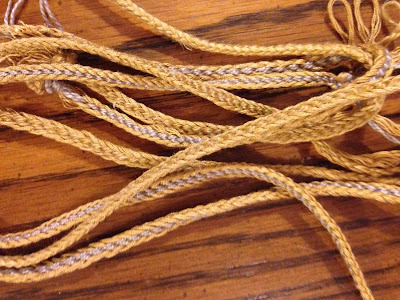 I attached the cord with a single strand of the gold floss, using a whip stitch that followed the lines of the braid’s own weave, so that the stitching disappeared completely. I then threaded a piece of the gold floss (in its original state, rather than untwisted and divided as I had been using it) onto a bodkin and threaded it through the edging as false lacing, passing it between the silver yarns in the centre so that it looked as if it had been braided into the cord in the first place. Once the edging was secured, I put the lining on the back. I lined the tabs first (in the same fashion as stays, doing each one separately), followed by the main triangle, and slipstitched the edges down. I chose a black and white printed cotton based on the linings in the Alsace Bodies (1770s French stays) and some other extant stomachers. I happened to find this cotton print at my local Halifax Fabricville (like Joanne's, I think, but maybe worse? Except for the quilting cottons, which mostly consist of large prints of fruits and vegetables, there are no natural fibres). The very last step was to add the aglets, which were made for me by another reenacting friend, Guthfrith. I attached them by knotting the ends of the lacing cords and gluing the knot into the top of the aglet tube, just out of sight, and then using the hole punched in each aglet to stitch through this knot and keep the whole thing firmly in place. 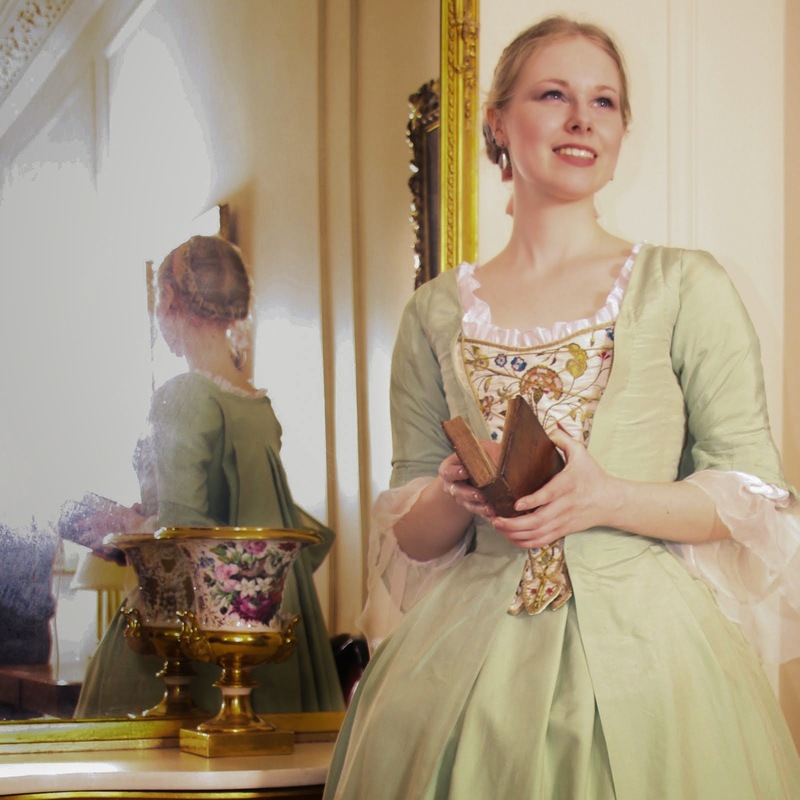 Of course when I finished the stomacher the first thing I wanted to do was try it on with the dress – but the dress wasn’t even close to done. So I did silly fittings instead. As finishing touches to the outfit, I made some cuff ruffles out of silk gauze and attached them inside my chemise cuffs (I realize that this in incorrect, but I didn’t have time to properly bind the cuff edges of the gauze, so the most stable way to mount them was on the chemise). At first I tried to roll hems on the silk gauze, but I quickly realized how truly ludicrous this was, and pinked them instead. I then poured about ¼ bottle of clear nail polish onto the pinked edges to stabilize them, because I don’t think I’ve ever seen fabric as delicate and wispy as silk gauze. It’s almost like it’s not there. I also fixed some shoes from the 1930s or 40s to look like the 1730s (I’m lucky – I have narrow feet, so I can wear vintage shoes). I found ivory leather ones with a French heel and stitched on some blue silk bows made of a scrap of the piece of taffeta that I had kept out of the dye pot. They’re not perfect, but they can’t really be seen under the gown anyways. And they look awesome with my blue American Duchess clocked stockings, white hoop/chemise, and blue and ivory stays! This photo is from later, with different stockings, obviously, but the quality of the other photo was horrendous. I finished the gown in time to be featured on Halifax’s morning news, along with two of my classmates (Laura, in a deep red silk mantua, and Julia, in a red and gold silk jacket and skirt combo. Julia also disrobed on camera – gasp – so that you can see her stays and hoop). You can see the video here. Seeing the footage later that afternoon, I decided my cuff ruffles were too long, so I trimmed them back pretty drastically before the show the following day. I don’t think I changed anything else, which was awesome – every year we hear horror stories of people sitting backstage desperately finishing things, and I had been determined from the start that my gown would be *done done done* before the night of the show. The show was a very lovely affair at the extraordinarily beautiful Government House, which is itself a Georgian building and is decorated with an eclectic but gorgeous mix of historical furniture and art – Victorian chaise lounges and side tables, Georgian-style woodwork and mirrors, a room with stunning metallic wallpaper from the 1920s (see the photo of my back pleats at the top), and of course a massive portrait of Queen Elizabeth II towering over the stairs. The show was followed by lots of goodies and tea that no one could touch for fear of ruining their gowns (I poured myself some tea and thought Lynn might have a heart attack), and many, many, many photos. I was incredibly privileged to have the help and support of so many people on this project – from the people who helped provide supplies and historical details to the outfit itself to the people who made a point of coming to the show. Much of my medieval reenacting group was following the progress of the project and providing moral support, and my family back home was doing the same. Special thanks to my dad, who flew out for the show and indulged all my photographic whims! In the end, it was probably crazy to decide to hand-embroider the stomacher and hand-stitch every part of this ensemble in the time I had, and to the parameters of the project. But I kind of thrive on crazy. And I’m really happy with the result. By the way, that book is a beautiful copy of collected texts (including Homer, Ovid, Chaucer, and Boccacio's Decameron). 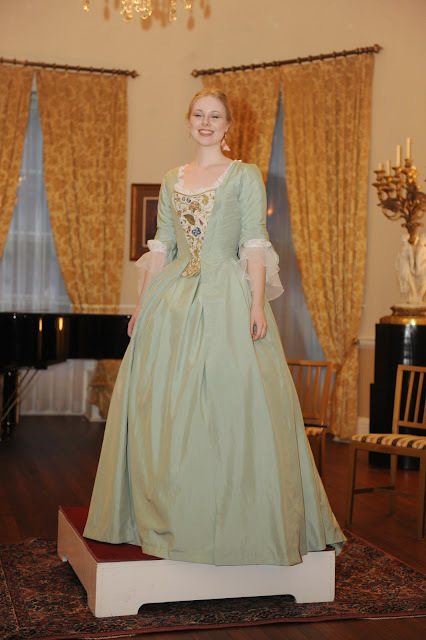 It was printed in 1721, so it is perfect to be paired with this gown! It was given to me by my friend Joanne, who collects antique books, when she heard about the dress. Seriously, the people who have contributed to this project are amazing! To those who made it all the way through this dress diary, I hope that at least some of the information I’ve provided here is helpful or interesting to you. I frequently rely on other costumers’ dress diaries to guide me in my own construction processes, so I hope I can pass the knowledge forward and provide the same assistance to others. Please don’t hesitate to ask if you have any questions about how or why I did something on this gown, or anything else I post here! 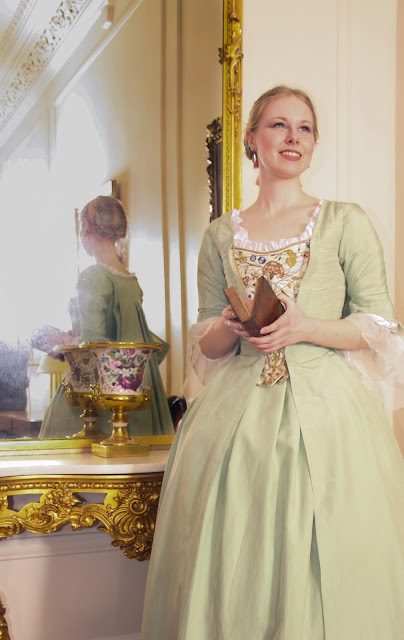 I have just started into researching and recreating historical costumes. You are my hero! This ensemble is gorgeous. Thank you for sharing it. Absolutely fascinating read - thank you for going into all the detail of the process, I loved it! I'm a quilter myself, but things like this make me want to try more dressmaking! So glad you enjoyed it! Quilting isn't something I've tried, so perhaps we'll end up dipping toes in each other's fields. =) Good luck! 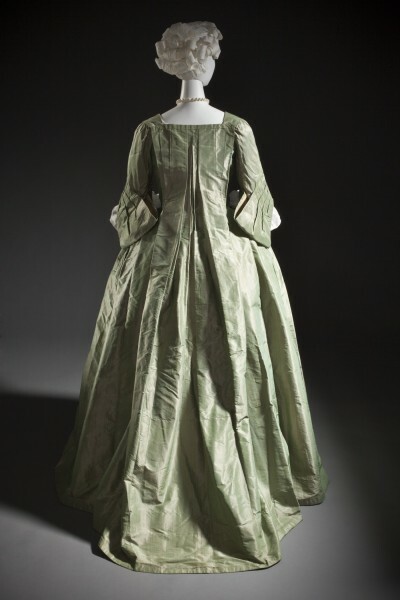 Background image: a quilted petticoat of emerald silk taffeta, mid-18th century, which I had the pleasure of examining at Dalhousie University. Hey! I'm Peryn, known in the SCA (and other reenacting) as Isabel Northwode. 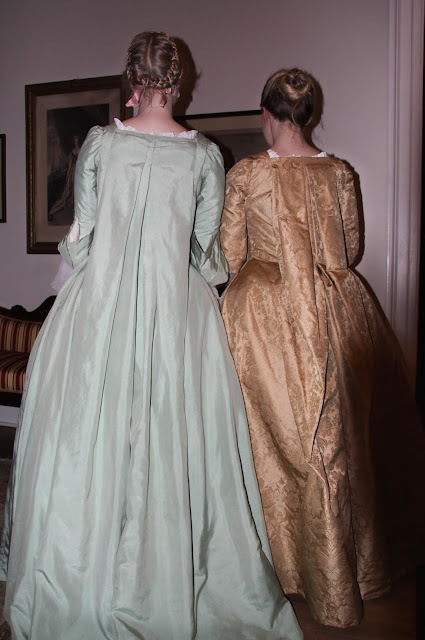 I'm a reenactor, a costumer, a singer, and also a student, currently studying the history of dress. I have a facebook page (Isabel Northwode Costumes) and an Instagram (@peryn.wn), which I update with random thoughts and photos as I work on projects. Finished dress diaries go here. I'm currently based in Scotland, but I'm originally from Toronto, Canada.